In December, Rapunzel of Sweden launches the leave-in spray Sweet Winter in a limited edition. A new conditioning spray with anti-static and anti-frizz effect, that adds moisture to the hair. Rapunzel's new conditioning spray is softening, adds shine and eliminates static. It contains hydrolysed proteins that increase and maintain the amount of moisture in the hair, as well as chamomile extracts that have a soothing effect on the hair and scalp. It is also entirely sulphate and paraben free. Leave-in spray Sweet Winter has a mild and sweet scent with elements of vanilla and caramel that is balanced with cedar and jasmine. It can be used on both natural hair and hair extensions. Spray over lengths, in dry or damp hair, without rinsing. 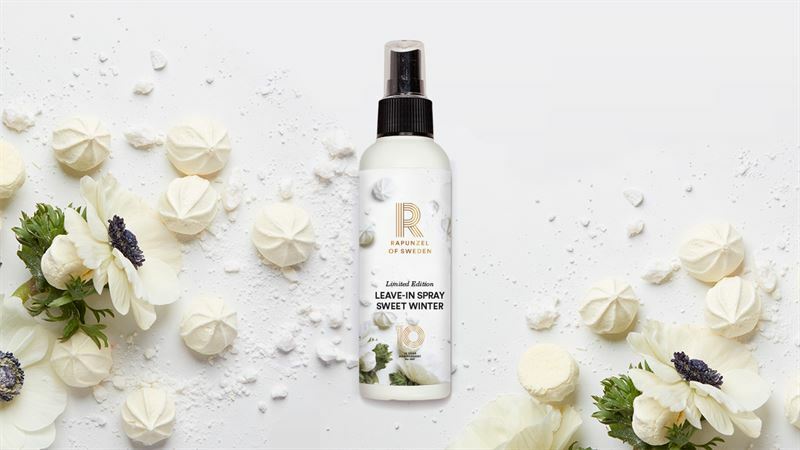 Leave-in spray Sweet Winter is launched in December and will be available for sale on rapunzelofsweden.com and at Rapunzel Concept Stores in Stockholm, Gothenburg, Malmö, Uppsala, Umeå and Helsinki. Rapunzel of Sweden is one of the Nordics leading hair extension providers. In just a few years the company has grown extraordinarily, and today Rapunzel of Sweden is a large and highly publicized online company with customers in over 60 countries worldwide. The company uses its own brand, Rapunzel® and supplies hairpieces, wigs and hair care to many people worldwide. In addition to a great online business, headquartered in Umeå, Rapunzel of Sweden also started Rapunzel® Concept Stores. There are salons in Umeå, Stockholm, Malmo, Gothenburg, Uppsala and Helsinki. Rapunzel of Sweden is one of the Nordics leading hair extensions companies operating mainly on the internet with customers in more than 60 different countries. The company uses its own brand, Rapunzel® and delivers hair extensions, wigs and hair care to hundreds of thousands of people all over the world. Apart from the large online business with it’s head office in the city of Umeå (Northern Sweden) Rapunzel of Sweden also has established the Rapunzel® Store Concept, and the foundation Rapunzel vs Cancer.